Oh my goodness. This book is incredible! It's based on a Russian fairytale and Ms. Arden did a wonderful job of bringing it to life. It's rare when I run across a book nowadays that totally sweeps me away. There were even times when I was even shivering from the cold of the winter in Rus and the temps here have been in the 70s. There were other times when the tale brought me to tears. 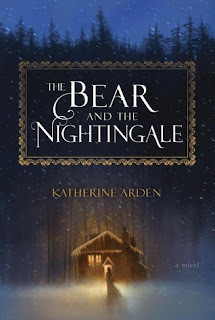 Ms. Arden has a deft touch with her characters. They all were so detailed and three dimensional that they became real to me. I fell in love with Vasilisa and her strength. She had a touch of the Sight and refused to be put in the box that women typically resided in. The only thing that really reined her in was her love for her family and her people. I enjoy fairy tales but this is the first time that I have had the chance to read one that absolutely took me away from my every day life. I highly recommend it to any of my readers who enjoy fantasy or fairy tales. You won't be disappointed.